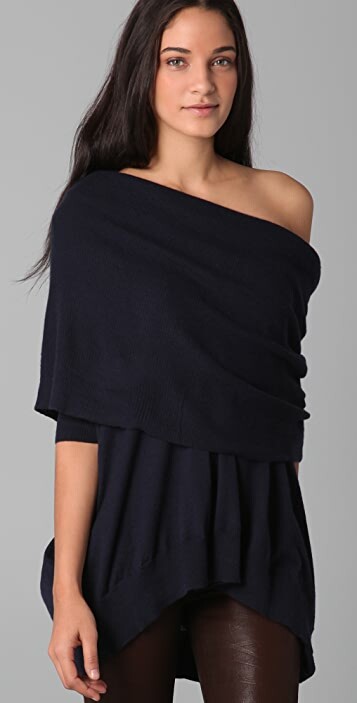 This fine-knit cashmere sweater features an oversized cowl-neck and side draping. Ribbed edges. 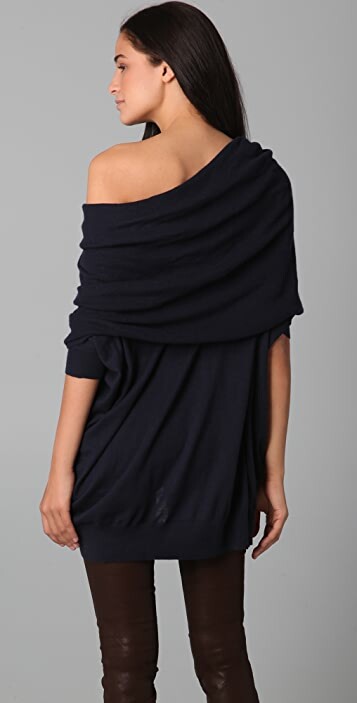 Elbow-length dolman sleeves. May also be worn off the shoulder. 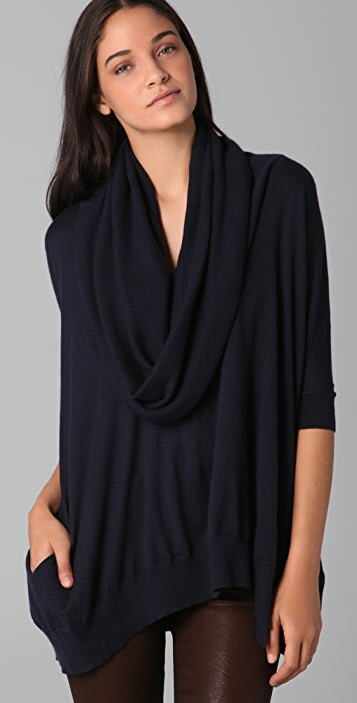 this sweater is so soft and so flattering - it can be worn in so many ways it's like a different sweater every time! My gut feeling was to order this sweater in Sz S as I would have preferred a slimmer fit. However as the reviews said it can be quite short, I ordered my usual Sz M. This sweater is huge and is as pictured. I really would have preferred to received a smaller size but nevertheless it is very comfy and perfect for my frequent plane trips: just like a cozy cashmere blanket. It is quite sheer so I may wear a cami underneath. An unexpected find were the cute little pockets on the sides of the sweater. Love! Love this sweater, it's certainly "oversized", I mean, they tell you in the name. But it's a great piece to wear with skinny jeans or pants. Definitely a good travel piece. I am considering ordering another one. Looks great on!!! Luckily purchased at sale price though as expected this cashmere sweater to have a softer feel to it. i am 5'5, 120pounds, Orderd a size S in black at sale price, it fits me perfectly. 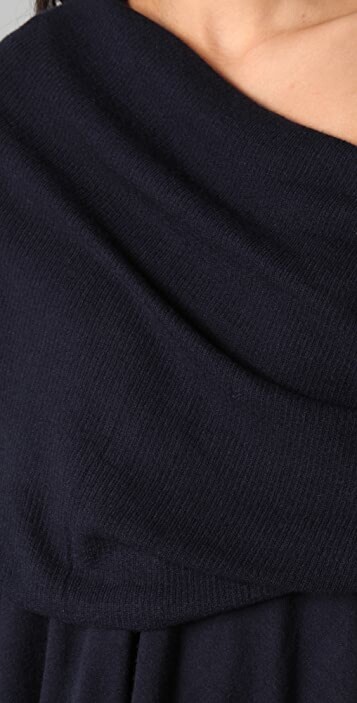 its not the best quality cashmere but its quite warm. Would love to get one more in another color, unfortunately they dont have it in S.
The sweater looks good although the fabric is not as soft and plush as I was expecting; also, it does look good but you kinda have to play with it a little to find the best fit for your body. Definitely order a size (or 2) bigger. sawdust is the perfect beige color and can you ever really go wrong with cashmere? i love the loose fit and wrap-like cowl. a lot of compliments! I was alittle hestitant about getting this sweater from some of the other reviews, but don't! It's so gorgeous on & I've recieved many compliments. I'm a small frame (wt-120 ht-5'5). Get it! I returned the sweater because I felt for $150 it was just nothing special. I did not realize from the picture that the sleeves are short.